by Phil Schwarzmann | Humor | This book has not been rated. I got this book from my cousin Eeva, seems like an interesting read..
An enetertaining book, I did recognize some of the "facts" Phil wrote about Finns. Next stop Tarna. Thank you, Piiku! I returned home from a long week-end yesterday evening and found this book waiting for me. I was so happy to find out it's just a small book — but not-so-happy to realize the print is sooo small. Hmm, maybe I'll read this at my parents' place, they've got magnifying glasses lying here and there. Then I saw there was sticker and once more a wonderful & poetic postcard. Those made so glad again. Thanks! I don't think I'll read this one too soon because I have a long-term release plan for it. That's why I'll mark this book reserved. 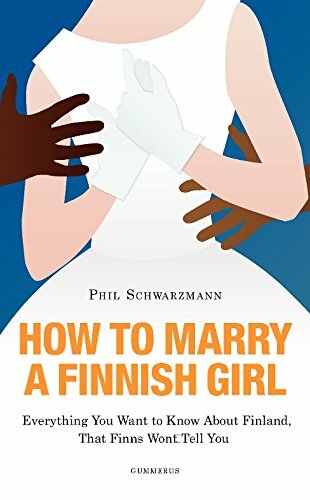 How to Marry a Finnish Girl is a tongue-in-cheek book about Finns, and it is quite hilarious in part but it also is pretty outdated. For instance, Antti Rinne (the leader of the Social Democratic Party) is the only one who still talks about welfare state. Everyone else seems to have abandoned the idea long ago. I did like this book even though there were times I was asking, “Really? Where in Finland people do/say so? And where do you come from, America? !” (The last one was when Schwarzmann was talking about Finnish “winter lights”. I mean, really?!) But let's be honest, he often did hit the nail on the head. He does know the Finns. Thank you for this reading experience, Piiku. It was truly fun. Finland celebrates the centenary of her independence this year and I've decided to offer a few Finnish/Finland related book in greenbadger's One book a month thread. This witty little book is the first one, my February offer. For time being, it stays reserved. ETA, on Feb. 26, that this book is now reserved for Haugtussa. It's in the mail. I hope you enjoyed skiing and will also enjoy this little book. The book arrived to day, thank you very much for passing it on. Like the Finnish people Norwegians also love to know what people think about us! Thus I could relate to this book. Admittedly, my knowledge about Finland is quite limited; skiing, lakes, Jukola, and the Moomins! This was an enjoyable read, and I have further plans for the book.